This entry is part 2 of 10 in the series Pulse Storm Posts. Earlier posts include Pulse Storm GitHub and Station Identification. Later posts include Announcements, Commerce Bug 1.0.2 is Out, Commerce Bug 1.1 and Supporting the Future, Commerce Bug 1.2, Commerce Bug 1.3 released, Commerce Bug Tutorial: Access Control, Commerce Bug 2.3 Release, and Commerce Bug 2.3.1 with Theme Inheritance. 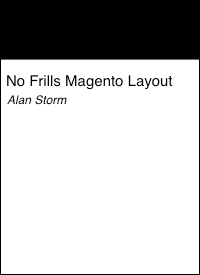 I’m pleased to announce the immediate availability of No Frills Magento Layout, the only Magento layout book you’ll ever need. Clocking in at a dense 160 pages, this DRM free PDF is the perfect starter for developers new to Magento, and even old hands will benefit from its comprehensive approach. You can learn more about the book by sampling a few chapters online. You can also checkout the mini-site which will let you know exactly what each chapter covers, as well as provide feedback and ask questions about the book’s content. Get your copy today and start coding circles around your competition. If I can drop out of Press Release Mode™, after I spoke at the first Magento Developer’s Paradise conference in Mallorca I was approached by a few publishers who wanted me to write a Magento book. Serious, big time publishers. I ended up doing something that the 2005 version of me would never understand. Writing any book, especially a technical book, is a huge undertaking. Most software developers who go through the process describe it as one of those fantastic experiences they never want to experience again. It’s at least six to eight month of incredibly fast paced, chaotic work with a hard deadline that if you miss, it means your book doesn’t get published. All things I’m used to from the services world, but cranking out code on a deadline is far easier for me than cranking out prose. There’s also the problem of time and money. You never write a technical book for the money, but bills still need to be paid while you’re sweating the words. I’m fortunate enough to make a decent living, but not so decent that I could take a 6 month income hit for something I wouldn’t own in the end. Finally, and what really tipped the scales, was I knew I wouldn’t be able to write book I wanted. Even at the early stages with Serious Publishers™, it was clear they were pushing for me to repurpose content from my website and then bolt on a few chapters of “How to Do X in Magento”. I wanted to write something that would teach PHP developers how to use and understand Magento, and maybe slip in a few lessons on that insidious object oriented programming that all the kids are talking about. Serious Publishers™ want the 300 page book that’s fastest to market and can be marketed. So No Frills Magento Layout is step 1 in my compromise plan. A single informative book that covers an important Magento subsystem in depth. The approach is the same as all the articles I’ve published so far. Teach you the theory by focusing on the practical. Show you how things work so you can solve you own problems without wasting time glopping in the dark. Outside of two years gig at a newspaper and this blog, I don’t have real-world publishing experience. Putting together a book is always a daunting task, and by forgoing a publisher I also forgo professional editing and technical review. That’s where the mini-site comes in. I’ve done my best to ensure that things are correct in the book, but I’m also one person. With three major versions of Magento out there, and the duct-tape state of smaller stores and the agency world, it’s inevitable that some of the code in the book is going to fail for some users. That’s why each chapter page on the mini-site has a DISQUS thread. If you buy the book and are having trouble with a particular code sample, or even my tortured use of the english language, you have my pledge that I’ll respond to your questions and comments there. Same as on Stack Overflow, I won’t do your job for you, but I will help you understand the code and concepts No Frills is teaching you. I know there’s a market for these sort of books and this information, but I have no idea how large a market exists. As much as I disagree with some of the choices made by technology book publishers, they make those choices because they know how their business works and they know what sells. My pie in the sky plans are for this book and Commerce Bug to do well enough that I’ll be able to use the profits to bootstrap another few books in the series, with the next round including professional copy-editing and technical review. I’m sure the next few weeks are going to be a flurry of extra work in support of the book launch. After that I’m hoping to get back to a few things that have been on the back burner, like fixing the RSS diff feed, properly packaging up the IE9 fix, getting the next maintenance release of Commerce Bug out the door, as well as writing up a few new articles about incidental things learned in writing and self publishing a book. Despite moving into the paid content racket I have no plans to shut down operations here. Selling zeros and ones is a weird business. If I have a larger goal for Pulse Storm it’s finding the middle way between no holds bared capitalism and the free/open web that’s made my life and career possible. For those of you buying my products, providing me feedback, and otherwise helping me along the way, you have my deepest appreciation.